A crankshaft is one of the most important parts of an internal combustion engine. The basic function of a crankshaft is to convert the linear motion of a piston in rotary motion. You might have heard these words many times or you had seen these parts also. But what exactly you know about these engineering parts? If you know something then this article will refresh your knowledge. If you don’t know anything then you are at right place. Below description will make you familiar with crankshaft used in Internal Combustion Engine. In multi-cylinder engine more complex engine crankshaft is used while in small engine simple design is sufficient. A crank throw or crank pin to which connecting rod’s big end is attached completes the conversion between two motions. This is an additional bearing surface whose axis is offset from that of the crank. The flywheel or crankshaft pulley is mounted on the crank to store the generated energy and to use for further work. A flywheel will also reduce the pulsation characteristic of the four-stroke engine. For smooth and vibration free running of the engine, the crankshaft is mounted in Main Bearing. Engine Bearings quantity depends upon various factors as like design of an engine, a number of cylinders, the design of crankshaft etc. But there are always at least two such bearings, one at the drive end and other at the non-drive end are used. If everything works fine, there is a rare need for engine bearing replacement required. In general, the crankshaft of a four-cylinder engine has three main journals, four crank pins, four counterweights and two crank webs. The counterweight reduces the bending load on the crankshaft and also helps the engine not to shake when the crank mechanism is rotating. 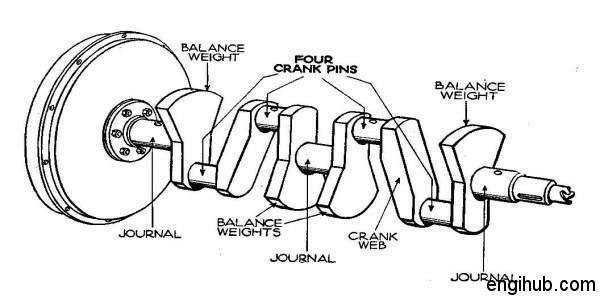 Crankshaft balancing mostly depends on counterweights. Engine crank web is the portion of a crank between the crankpin and the shaft or between adjacent crankpins. It is also known as a crank arm. A crankshaft seal is there to avoid the lube oil leakage from the crankcase. These types of cranks are around for a long time and are found in a lot of diesel and petrol engine. As the name suggests, these are made from Malleable Iron through a casting process. These are pretty cheap to make and works fine too hence they are a common choice for manufacturers. A flat plane crank is one where the journals are 180 degrees apart common in all in-line four engines. Whereas a cross-plane crank, on the other hand, needs a mould of multiple parts because the journals and counterweights are not symmetrical. Cast cranks can be flame hardened to improve wear resistance in particular areas. These are a more robust crankshaft than a cast crank. They are more commonly found in higher stressed engines and come standard with some 16v engine. A forged crank is made in a totally different way. A set of dies are machined to the approximate shape of the crank. These dies to sit in a very large hydraulic press having a clamping force of many tons. A hot bar of high-grade steel alloy is placed onto the bottom die and the dies are closed. Once the dies are closed the metal is squeezed in very tightly. The material is then both compacted and aligned better than the casting process. These type cranks are also hardened like the cast types but it uses Induction Hardening. Billet cranks are the best type of crank you can have in your engine if you want to get the most from it. 4340 steel is normally used to manufacture this kind of crank. This contains nickel, chromium, aluminium, and molybdenum amongst other elements. These cranks are popular because of lowest crankshaft machining time. They also require minimal balancing due to the uniform makeup of the material. It is usually made from Carbon Steel, Nickel Chrome or other Alloy Steel also. The alloying elements in carbon steel are manganese, chromium, molybdenum, silicon, cobalt, vanadium. Sometimes aluminium and titanium are also used. If your selection is based on above information, you will hardly require crankshaft repair or crankshaft replacement frequently.